I wrote this in 2011, more in tribute to the liberating power of satnav (then very new) than as a homage to Hollywood, which is really a world-wide community of sitting with strangers in a darkened space and being transporting to the far corners of the imagination by images and music. Los Angeles’s dubious reputation is “The city where nobody ever walks”. So it is appropriate that I should take my rented car on a tour. Now I speak as an avowed (whenever possible) pedestrian. But there are mitigating circumstances, and one very good technological reason for it to make sense. For causes that need not concern us here, my wife and I were flying home from Los Angeles on different planes – she, three hours earlier than me. So when I drop A. off at the international airport (LAX) I have a tedious few hours to kill even before I can begin checking in. I could hand in the hire car keys, take the bus to the terminal and hang about. Or I could drive aimlessly for an hour or so, but with no purpose, which is wearing and frustrating. But there was one real destination in Los Angeles that has to be interesting, even on a flying visit, for its formidable reputation alone. I decide to go to Hollywood. In the past I have tried to guide myself around unknown cities, with a high degree of exasperation, and a certain amount of panic when there was a plane to catch. So I do not think, realistically, I would ever have considered driving to Hollywood if it had not been for one piece of now indispensable in-car technology, the sat nav (or GPS as they are known locally). I punch an address into the GPS, checked from our guidebook. It is the Kodak Theatre, where the Oscars are held, and a good nominee as the spiritual heart of Hollywood. The screen tells me it is 10.3 miles away, that the trip will take a reassuringly manageable, if slightly optimistic, 33 minutes. I am soon out of the airport and heading along a reasonably free-flowing Century Freeway. The first of the extreme left-hand turns (where I turn right first, then make a complicated loop round on to La Cienega Boulevard) might have thrown me if I’d been map-reading on my own. I am soon heading north, along this major but strangely quiet freeway, passing a herd of nodding donkeys, pumping up oil, on both sides of the road, surely too authentic to be a film set. This is Ladera Heights, and these oil wells survive an earlier extraction boom in urban California. Then, to my delight, I glimpse the famous white lettered “Hollywood” sign on a distant hillside, about six miles away. Anyone who knows GPS in the USA understands how you soon adapt to anticipating a turning three or four blocks away, and how you can assimilate that information safely as you negotiate junctions and traffic lights. But traffic is building up on West Washington Boulevard, and my estimated time of arrival is steadily moving back: five minutes, then 10, until I am 20 minutes late. As I wait at traffic lights the tempting aroma from a street food van (on S. La Brea Av and S . San Vicente Blvd) wafts my way. (Released from the stressful and risky chore of map-reading while you drive you have time for these details.) It was to be the most authentic thing I would see. But he who pauses on the road to Hollywood is lost. So on I go. Hollywood is on a hill, and it presents itself from about two or three miles out as a pleasant, suburban (in a Home Counties sense), community of detached 1930s and 1940s houses with gardens and garages. 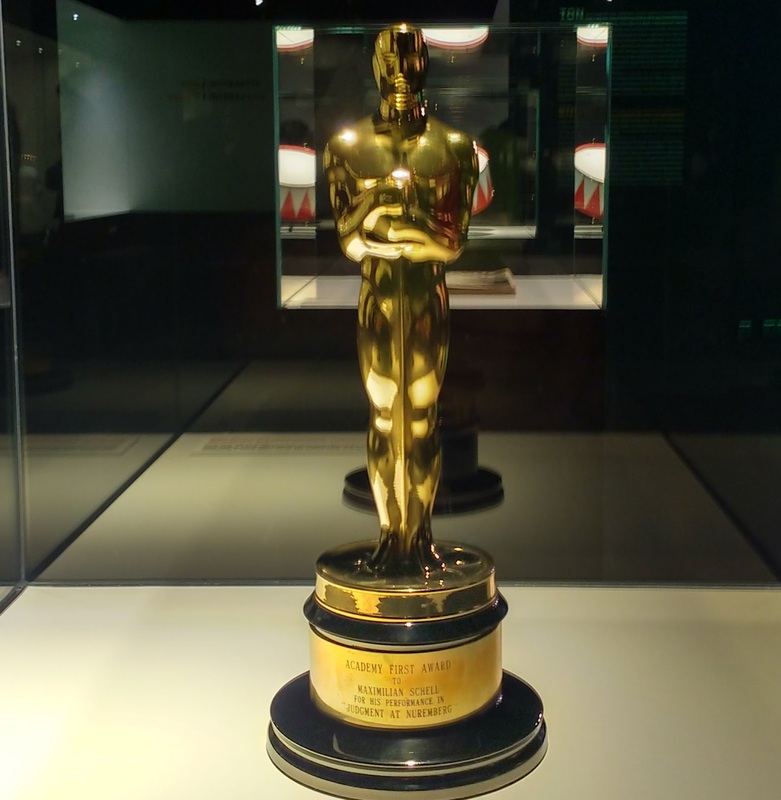 While people tended to their flowerbeds on North Highland Avenue, Marlon Brando, Katharine Hepburn, even our own Colin Firth, may have driven past on their way to collect an Oscar, if they didn’t qualify for a helicopter. Suddenly it’s Hollywood. 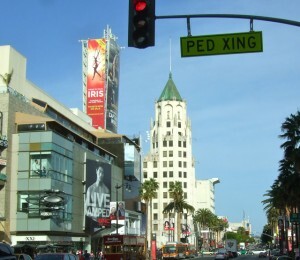 I’m crossing Sunset Boulevard, and running up one more block to Hollywood Boulevard. I turn right, then right again after 400 yards and park very conveniently for $5 at one of those ubiquitous street level parking lots tended by some polite Indians. During my brief foray along Hollywood Boulevard, I see depressingly clear signs that this repository of so much screen magic is no longer the place for dreams, unless you are a particularly heavy sleeper. I had set myself 35 minutes, to give me time to make it back to the airport. I join the tourist trudge: there are hustlers, cops apprehending a petty felon, people selling to tourists, people selling tours, tour operators berating other tour operators, people impersonating Elvis and Michael Jackson and letting themselves be photographed with you for a fee. I walk over some of the 2,400 5-pointed stars of the Hollywood Walk of Fame set in the sidewalk, honouring people from all parts of the motion picture business. This is one authentic Hollywood feature. However the Kodak Theatre, and the equally illustrious and historic El Capitan Theatre and Grauman’s Chinese Theatre, all within a few steps of one another, and splendidly restored, resemble something you’d find in a theme-park. More authentic details are the handprints, footprints, and autographs in the concrete of the Chinese Theater’s forecourt. 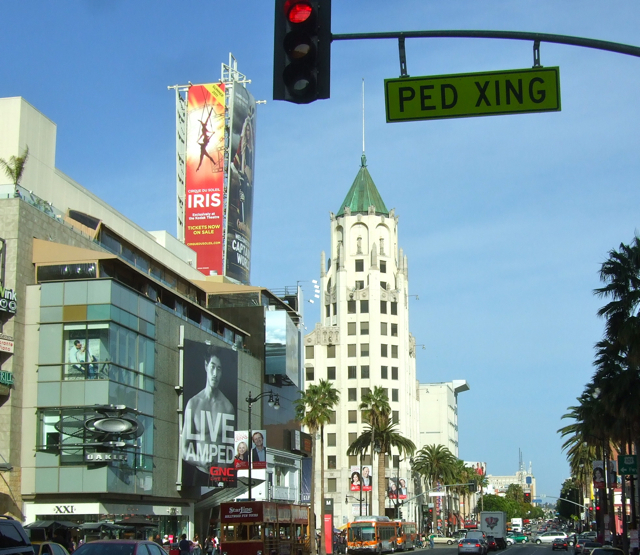 This is where the stars – Marilyn Monroe, Tom Hanks, Betty Grable, Jimmy Durante and so many more – made their dedication to Sid Grauman, founder of the theatre. Another real thing are the immense posters, on neck craningly-high billboards, avertising films showing, or soon to open. This, after all, is what they make here. Otherwise I feel I could more easily have found the true spirit of Hollywood in half a dozen of my favourite old cinemas back in Britain. There is a tawdry gusto to the place, and an edgy feel too. There are genuine old diners where the production teams eat, but they are set back from this tourist-clogged strip of flashy, high value real estate where only the big fast food names operate. I’ve seen enough, and besides, time was up. Back to the car park. I set the GPS for the rental car return area at Los Angeles airport, and head south, searching in vain for a radio station playing great themes from the movies. My electronic help promises me a 35 minute trip. In the event Mme Disembodied Voice guides me through all the tricksy turns of LA just five minutes over this time. Stepping out of the car at the return rental check-in line, it occurs to me I’d done something few other visitors in a tearing hurry could ever have done before, and certainly not as an impulse visit. I claim no special exploratory skills – the patient lady’s pre-programmed promptings take all the credit. But she could have warned me about Hollywood. As a friend said later: “it’s a state of mind”. Or a dream, best savoured from afar.